GN Solids Control’s compact structure mud system is designed on the basis of oilfield mud cleaning system. By simplifying the structure, reducing the unnecessary equipment and mud tanks and changing the system overall dimension, the mud system would be easy transported and assembly. GN’s compact mud system has unique features and full functions for drilling mud cleaning. For the industries like Horizontal Directional Drilling, Coalbed Methane, Geothermal Well drilling, water well drilling even the diamond core drilling, GN’s compact structure mud system have already widely used in these industries. 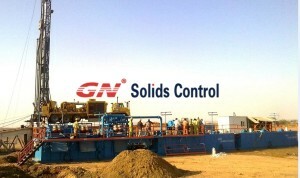 GN Solids Control just finished 1 set 200GPM treating capacity mud system for an Egypt project. In China domestic market, the main HDD rig manufacturer like TXS, XCMG, ZT as well as the world famous brand Vermeer have established cooperation relationship for equipped their rig with GN’s mud system. This Egypt customer came to GN via one of the HDD rig manufacturer in China. 1. GNZS752E-DM linear motion shale shaker 1 units. The design of the top located logging tank shortens the length of the vibrating screen box, which is very suitable for HDD compact structure design of the less width of the mud tank. 2. GNZJ752E – 4N desilter with 4 pcs 4 inch hydrocyclone separation for down to 15 microns mud solid particles. 3. The slurry storage capacity is 15 cubic meters provide sufficient space for mud recycling and storage and small dimension is convenient for transportation. 4. GNSB4x3-11 shear pump 2 units. One of which is used for transferring slurry to de-silter cyclone, and another is used for mud mixing system. 5. Mud Agitator and mud gun are also equipped for make the suspending style drilling mud. In the past few years, GN Solids Control has delivered more than 10 sets complete compact structure mud system to Egypt by cooperating with China main HDD rig manufactures. Egypt is a trenchless technology mature and developed market and they have their own industry standards, the annual demand of mud system is gradually growing. Especially the model of 200GPM to 500GPM series what are popularly welcomed and recognized. GN Solids Control can also offer the hydraulic jack-up design HDD drilling mud recovery system design for limited area job site easy transportation.